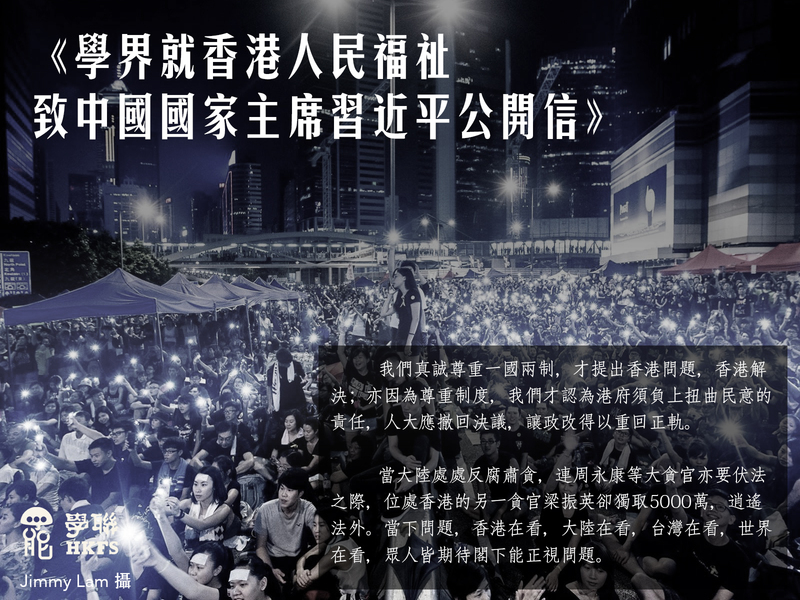 You once said, “We shall always listen to the people, respond to their expectations and ensure equal rights of participation and development, so as to maintain social justice.” Don’t Hong Kong people’s persistence for an equal system echoes with your thought? Hong Kong people’s proposal of the abolition of Functional Constituencies and Civil Nomination within the Chief Executive electroal framework or the nominating committee aims at guaranting equal participation and rights, with a view to achieve an equal development and protect social fairness and justice. The occupy movement today at Hong Kong is definitely not a colour revolution or its alike, but rather a movement for democracy. The class boycott initiated by students and occupy movements across the city are our response to CY’s aversion towards public opinions. We demonstrated peacefully, but were confronted by violence; we howled, but were made silent by pepper spray and full-geared police. Yet the choking gas lingered in Central could not scare the citizens, but only triggered more to stand against this unscrupulous government and affirm justice. A genuine universal suffrage should never be drawn equivalent as subversion. It rather serves to exhibit the high degree of autonomy embodied in Basic Law. National defence and diplomatic matters have always been adminsitered by the Central Government. If the Central Government is confident of her governance, she need not be fearful of a Chief Executive elected by Hong Kong citizens. Genuine universal suffrage will only reaffirm such autonomy and be another exemplar of yours. Our respect towards the principle of “One Country, Two Systems” is the precise reason to put forward that Hong Kong shall resolve Hong Kong’s problems and citizens’ opinion must be given heavy weight. This is precisely the reason why HKSAR government should be guilty of misunderstanding us, and shall help to rectify the political reform by urging NPC to withdraw her decision. The current situation catches attention not only from Hong Kong, but also China, Taiwan and even the rest of the world. We have high hope for you to take this matter closely. It is by no means worthy letting a corrupted official jerpardizes “One Country Two System” and blemish the grand “China Dream”. Copyright © 2014 Hong Kong Federation of Students All rights reserved.